The Taylor Candy/Deep Fry Stainless Steel Thermometer is easy to use and provides superior results for professional and amateur cooks alike. A classic paddle design is perfect for making candy or tracking oil temperatures for deep frying. Includes an adjustable pan clip that securely affixes the thermometer to almost all pan types. An oversized stay cool handle provided easy removal from the pan after use. Large, bold numbers are easy to read. Key temperatures ranges are printed directly on the stainless to help monitor the cooking temperatures. An easy-to-read, 8-inch face measures temperatures from 100- to 400-degrees Fahrenheit. The insulated handle’s adjustable clip secures the thermometer to the cooking pan for safety and stability. Markings on the thermometer’s face shows the range of proper candy temperatures, from thread to hard-crack. 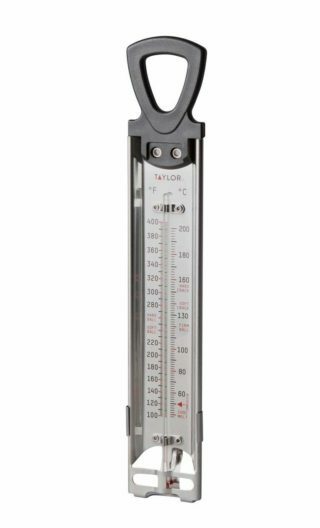 The thermometer measures 12-inches in length, and is made of durable stainless steel. This thermometer should be cleaned with a damp cloth and wiped dry. Measures temperatures from 100- to 400-degrees Fahrenheit. Not easy to clean, not dishwasher safe. Printing of the numbers not very durable. Don’t use the abrasive side of the sponge or it’ll wipe the numbers right off.